Pick your Excel task, find it fast, and get it done with Just the Steps! 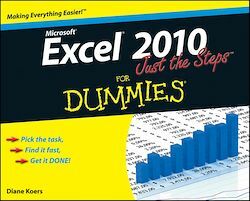 If you want to see how to do a particular Excel task, this is the perfect book. Each page includes step-by-step instruction in one column and illustrations and screenshots in the other column, so you have all the information you need in one place—no flipping pages! Improve your Excel skills with just the steps for entering spreadsheet data, building formulas, protecting excel data, formatting cells, designing spreadsheets with graphics, managing workbooks, changing worksheet values, sorting and filtering data, creating charts, creating PivotTables, building macros, integrating Excel into other Office programs, and—whew!—still more. Make your tasks easier, improve your Excel skills, and get better results with this step-by-step guide.